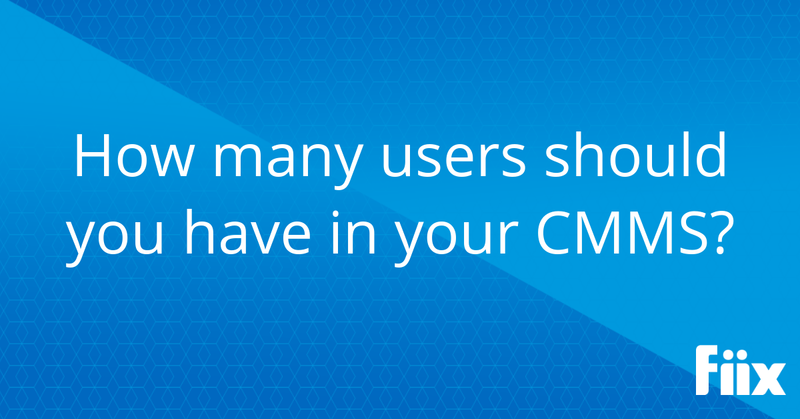 How many users should you have in your CMMS? You’ve taken the first step towards ironing out your maintenance strategy by getting maintenance management software. But how many CMMS users do you actually need? Should all members of your maintenance team be able to access the system and log work? The short answer is yes. But one common strategy in maintenance departments is to keep CMMS users to a minimum and just print out paper work orders for technicians. There are two major reasons why an organization might opt to print work orders from a CMMS, then just fill the information in the system at the end of the day. A lot of organizations think that having minimal users in their maintenance software is a good way to save a few bucks. However, this is a shortsighted way of seeing things, and while it might be true at first, it doesn’t save you money in the long run. When you print out work orders instead of keeping all the info in your CMMS, your guys end up wasting a lot of time entering the info in the system at the end of the day. These billable hours (which would otherwise be spent working) add up to a lot more than the cost of a few seats in your CMMS. When someone has been working a certain way for so many years, it’s hard to get them to change. The maintenance industry has been paper-based for a very long time, and we know it can be difficult to convince your team that moving to software will be easy and productive in the long run. There is definitely a learning curve with a CMMS. But most software vendors offer training to help make the transition to the system way easier. It’s worth your while to invest in a bit of training and hands-on experience for your team, so everyone can get comfortable with the software. The problem with the hybrid approach to maintenance is that you’re taking one step forward by getting a CMMS, then two steps back by not using it to its full potential. Here are 3 things you risk missing out on when you don’t fill out work orders through your CMMS. Chances are, one of the major reasons you bought a CMMS in the first place is for efficiency. The system helps you get through work orders faster, helps you get on top of maintenance, and helps you work towards a preventive maintenance strategy. But a CMMS is only as good as the information you put in it. If your guys are still printing off work orders and just coming back to the system at the end of the day, you don’t have a full picture of what’s going on in your facility. On top of that, your team isn’t getting real-time updates when the status of a piece of equipment changes. Most CMMS software comes with a mobile app, which is a really easy way to log work and communicate with your team in the field. It lets techs update the system as they go, which means they can spend more time actually fixing things and less time doing data entry. It also means you can push work orders to your guys while they’re on the go, and they don’t need to pop back to the office every time to grab another stack of work orders. Do you remember all the details of what happened at 8:00 AM this morning? Likely not. Small details escape us throughout the day, but when these small details apply to one of your assets it can result in major information loss, which can have a big impact down the road. Logging information in your CMMS immediately means you have a much fuller picture of the state of your assets. And when it comes time to generate reports, your historical data will be much clearer. Working with a CMMS lets your team provide detailed updates and information on all your assets as they go, so no information gets lost. Looking for more info on how to get the most out of your CMMS? Check out our blogs on maintenance metrics and common maintenance strategies.